Send Letter Online in India! Do you have a document you want it to be printed and dispatched to anywhere in India? Enter the Shipping & Billing details along with special order comments if any. As soon as we receive your order, we will dispatch it at the earliest. You will receive dispatch receipt as proof in your e-mail id. Note: In case of any confusion in your order(with respect to printing), we will cancel it and issue FULL REFUND to you. 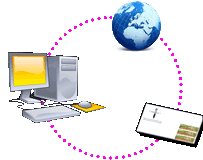 Indian post office too provides this facility of sending letter online electronically. Be ready to face bereaucratic hassles and waste lot of time and petrol. A maximum order of 50 is allowed.